First of all, it is true that real Russia begins beyond the MKAD (the ring road around Moscow). Moscow is indeed different from any other Russian city I’ve seen (and I have seen quite a few of them. Perm, Irkutsk or Krasnoyarsk all share the complex of a neglected child: they try to prove that, even though they are not Moscow, they still have something to offer (while in fact, they don’t have much). At the very first glance, you can see that the most of Russia’s resources (human and otherwise) go to Moscow and St.Petersburg. Perm has a ballet that can be compared to Mariinsky and Bolshoy. Irkutsk has Baikal. Moscow has everything. No-one is trying to prove anything to anybody here. You have to accept Moscow as it is – or not accept it at all. Nobody is trying to keep a newcomer here, as there are five others waiting to take their place. Moscow gives the first impression of being rather rough and not very welcoming, but it seems to me that it has a lot to offer to those who won’t let it overwhelm them – and I will not. 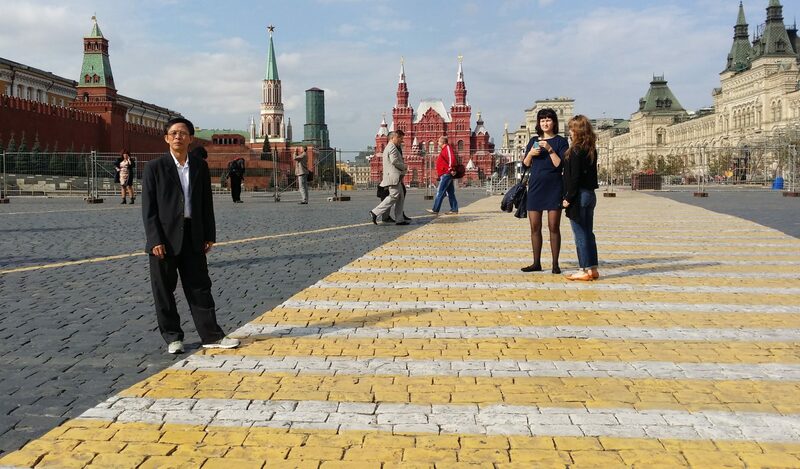 Just as the city itself, Russians seem to adopt an offensive-defensive attitude towards strangers. They behave like a badly hurt child who can defend themselves only by attacking All faces in the metro exhibit great concern or pure anger, and in rush hours you really have to elbow your way to the metro carriage. Just like in the case of a hurt child, though, it is enough to exhibit a little bit of kindness, genuine interest and confidence to discover endless reserves of warmth hidden in those at the first glance arrogant people. Once again my theory that Russians are Brits inside out (rude to strangers, yet capable to sincerely befriend them within the first thirty seconds of the conversation) finds confirmation in facts. Moscow most certainly is a city where you have to elbow your way around. You can see it not only in the metro but also in the traffic. Pedestrians are the weakest part of the food chain, and even those who are supposed to defend them (i.e. the ones responsible of managing the traffic) seem to confirm that. The red light for cars changes to green at the very same moment when green turns to red for pedestrians. Good luck, poor you with nothing to drive! Take care of yourself, run across ten lanes in twenty seconds! Drivers don’t care much about pedestrians either. I’ve seen more cars overtaking on pedestrian crossings than I could possibly count, not to mention cars driving across crossings with pedestrians already on them. Speed limits are more of a loose suggestion than anything else. In short, the only rule that really applies to the Russian traffic is the survival of the fittest. Therefore, whenever possible, everyone descends to the underground. Moscow exhibits yet another Russian trait which I have noticed before, namely their lack of care about their immediate surrounding. The way their living space looks like seems to be of no importance to them, they seem to treat is as temporary, separate, not dependent on them (your inner life, russkaya dusha flourishing on the pages of pretty much every Russian novel, is what they focus on – or at least this is what I choose to believe). In Perm’ there has been plenty of second-hand buses, bought in Germany, with German ads left on them for years and years of their service in Russia. Even in Moscow aesthetics of the public space seems to be some kind of a Western invention for which most of the times you have to pay a lot (in high-fly restaurants, in hipster co-ops, etc.). Some minor refurbishments in shared, rented apartments do not even cross their owners’ minds, neither does the idea of clearing the common space in those apartments of some old TV’s and unused shelves (left there probably by the grandma, to whom the apartment belonged in the 70s). On a more institutionalised level, nobody thinks about modernising the classic matchbox form of high-rise blocks of flats, which are the primary housing choice of a majority of the population of Russia. The ones that are being built now could just as well have been designed in the 70s. Another sign of the institutionalised neglect is the metro (as in Moscow, sooner or later, everything comes down to the metro). The political system has changed more than twenty years ago, and the metro is still named after Lenin, and it seems that changing the names of some of the stations was a purely marketing move. Metro is indeed the bloodstream of the city. No piece of information about you is as important as the metro station near which you happen to live. In Britain, it is your accent that defines you, in Moscow – your metro station. Any sense of belonging extends to the immediate surroundings of your metro station and sometimes to the entire metro line (e.g. something located eight stations away on your line is much closer than something located four stations away but on a different line). Consequently, Moscow is a city which nobody really knows. Even the most exquisite geographical mental capabilities are limited – Moscow is just too big to be fully known. On multiple occasions was I asked about the way to the metro by some evident locals. You know your own metro village and the metro village where you work, and the rest of the city remains a labyrinth for you to discover. Isn’t that beautiful? Moscow is beautiful at this time of the year: the sun is still shining, but the leaves are turning to all shades of brown and orange, and the air smells of autumn (but not that damp autumn that Edinburgh smells of all year round, but real, crispy, cold early autumn and falling leaves in a country that has seasons). For the very first time, I have chosen a place to live just because of that place, not because of a school that happened to be somewhere. Moscow felt a little deserted to me so far, as I don’t have much of a social life here yet. In the very first days in a new place you feel completely detached, in your own bubble, still kind of landing (like in “Solaris” – I just hope I won’t discover I’m in a place which I cannot understand, but which sends me a memento of some my mistakes). Despite (or rather because) all that I am so very, very happy to be here now. I must admit that in first week-and-a-half in Moscow I lived in a limbo, not knowing where I’d live and whom I’d teach, so up till now I was on a sort of a holiday. Now the work has begun and I am more of a local. I am very curious how that switch will change my view of the city. For now, though I have to get rid of some of my Edinburgh habits: keeping to the left and translating the British politeness literally from English into Russian.